Optional bucket sizes: 12" or 18"
Max. bucket digging force: 2,021 lb.-ft.
Wacker Neuson has added the 0.8-ton 803 mini excavator to its line. Designed as a breaker carrier, the unit has a large hydraulic reservoir to deliver 5.8-gpm auxiliary flow. The breaker, buckets and other attachments are available as options. The unit is 27.5 inches wide with a telescopic undercarriage that extends to 34 inches. Maximum digging depth is 5 feet 9 inches, and maximum bucket digging force is 2,021 lb.-ft. Rubber tracks are standard, and a foldable ROPS reduces machine height. An optional debris guard fits between the work-group and operator station. 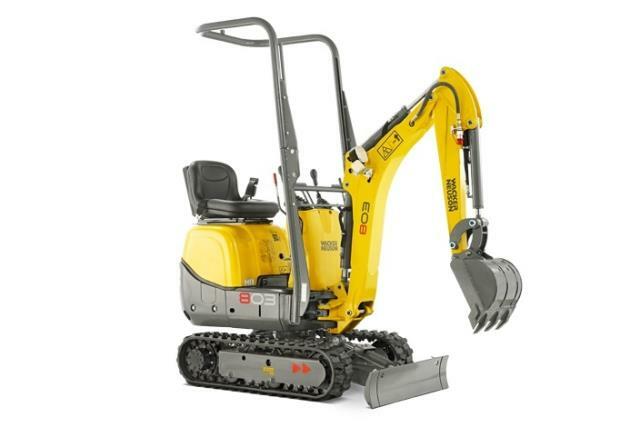 A Yanmar 13-horsepower diesel powers the excavator. * Please call us for any questions on our excavator wacker 803 5 foot 9 inch depth 27 inch wide rentals in Eden Prairie Minnesota, Bloomington, Chanhassen, Minnetonka and surrounding Twin Cities communities.